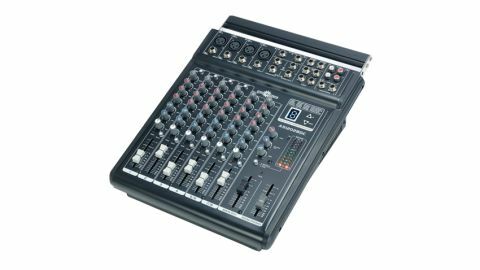 If you're looking for a punchy, clean sound for a great price, this powered mixing console could be for you. Good connectivity. Useful on the road and in the studio. Retractable carry-handle. Built-in effects aren't the best. Could do with more headroom. Odd behaviour of secondary 'phones output. When specifying or upgrading a small PA system, there are two main options available in the area of mixing and amplification: a mixer amp head or a powered mixer. The distinction between the two can become blurred, but most would consider the former to be akin to an on-stage amplifier, albeit with multiple input channels, and the latter to be a standard mixing console with an internal power amp. The Gear4Music AS1202BDC Powered Mixing Console falls into the latter category. The AS1202BDC is laid out like a traditional compact mixer: all connectors are located at the top and rear of the unit, with the rest of the main panel dedicated to mixing and controlling the sounds passing through the console. The mixer offers a total of 12 input paths: four mono mic/line input channels (1-4), two stereo input channels (5&6 and 7&8), and two stereo auxiliary inputs - one intended as an effects return (9&10), the other as an input for a playback device such as a CD or MP3 player (11&12). Each input channel has an input gain control, three bands of EQ, monitor send and effects send controls, a pan or balance control, a mute button, a signal peak LED, and a 45mm-throw fader for controlling the channel's output level. In addition, the mic inputs (1-4) also have a 100Hz low-cut switch - very useful for eliminating mic handling noise. All of these inputs feed a master section where, alongside pots for controlling the effects buss send and return levels and the two-track input level, are a further pair of faders. One controls the L-R buss master level, and the other controls the amount of L-R buss being fed to the room/phones output (more on this below). The master section is topped off with a built-in digital effects processor and a pair of nine-segment LED level meters. The power amp's controls and connectors are all positioned on the rear panel of the mixer. Speaker outputs are provided on both jack and Speakon sockets, and a large dial above these connectors controls the power amp's output level. There is also a phantom power switch that provides 48 volts globally to all four mic input connectors, thus allowing you to connect condenser or back-electret mics. The rear panel is rounded-off with a retractable carry handle - a welcome addition given the unit's not-insignificant 9.5kg weight. When it comes to the ins and outs provided by the AS1202BDC, Gear4Music hasn't pulled any punches. Each of the four mic/line channels has both XLR and jack sockets, whilst the two stereo input channels and the effects return buss are also fed by jack sockets. The second auxiliary input (11&12) is fed from a pair of RCA/phono sockets, in keeping with their intended use (see above), whilst a second pair of RCA/phono sockets provides a direct recording output for the L-R buss. As well as being fed to the internal power amp, the L-R buss also drives the main line-level output of the mixer and the curious room/phone outputs. This last pair, when used as a control room output, works as you would expect: the left-hand connector carries the left channel, the right connector the right channel. But when connecting a pair of headphones, the left-hand connector delivers a normal stereo headphone signal, but the right-hand connector delivers the right output channel to the left headphone, and nothing to the right. This doesn't appear to be a fault as it is in keeping with the schematic in the manual, but why this configuration? A round-up of the connectivity wouldn't be complete without mentioning that the L-R buss sports an insert point in the form of a pair of TRS jacks wired in a typical 'tip=send, ring=return' manner - a nice addition on a mixer in this class. Mixing consoles have to take a number of signals and blend these together into a single, or dual in the case of stereo, signal. In a live situation, where the signals coming into the desk can be very dynamic and peaky, it is important for the mixer to have something known as headroom - in other words the ability for the mixed signal to get quite overloaded before audible distortion or clipping occurs. This allows unexpected signal peaks - such as when the vocalist's performance gets a bit over-indulgent or the guitarist 'does a Townshend' to his rig - to get through the mixer without causing any problems along the way. This is an area where the AS1202BDC could be improved, as the headroom seems quite limited, making it all too easy to audibly overload the main stereo buss. Of course, a judicious set-up (and possibly a mate to man the faders, just in case) will let you work around this little shortcoming, and it's unlikely to be a problem at all in a studio or recording situation. The built-in digital effects processor offers a selection of 16 preset effects, comprising reverbs, delays, chorus, flanging and rotary speaker simulation. There is also a vocal cancel effect, but this is a process that has to be applied as an insert effect in order to work, but here it is being applied as a send effect. The upshot of this is that the vocal cancel basically does nothing. Overall we are not terribly impressed by this processor. There is no way of editing any effect parameters and the results are only passable in a live situation. It's all too easy to overload the processor's input (there is no level metering for the effects buss or the effects processor), and this results in some fairly startling squeaks. Thankfully the effects buss can be directed into your own external processor, and by hooking this back up with the mixer's stereo effects return the internal processor is disabled. Overall this is a nicely thought-out unit that will be useful in the studio and on the road, although the latter is where it will be most at home. The sound quality is clean - about what we'd expect from a mixer of this ilk - and with its loud punchy power amp, good connectivity and attractive price, the AS1202BDC is definitely worthy of consideration.